This is the HO Scale 72' Streamline Sleeper Southern Crescent Limited by Con-Cor. This is the HO Scale 72' Streamline Sleeper Great Northern Empire Builder by Con-Cor. 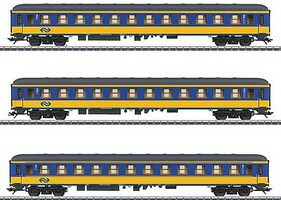 This is the HO Open-Sided Excursion Car With Seats By Bachmann For ages 14 years and up. This is the HO Scale 85' Budd Observation New York Central by Walthers Mainline. 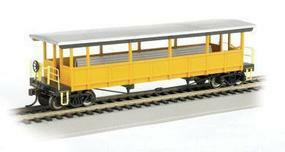 This is the HO Scale SNCB M2 Commuter 4-Car Set from Marklin, Inc. This is the HO Scale 85' Smooth-Side Observation Car Baltimore & Ohio from Bachmann. This is the HO Scale 85' Budd Diner New York Central by Walthers Mainline. This is the HO Scale 72' Streamline Railway Post Office Southern Pacific Daylight by Con-Cor. This is the HO Scale Solarium Pennsylvania RR #1120 Futura from ConCor Trains. The Rock Island was a commuter service between Joliet and downtown Chicago. In the late 70's and early 80's, around the time of the formation of the Regional Transit Authority, the Rock Island line was going through bankruptcy and had great difficulty keeping its own locomotives in service. As a result, the Rock Island line was the first to receive the brand new Chicago RTA F40PH locomotives.